How to Analyze Horizontal Forces and Bending Moment on Pile Group? Unlike shallow foundation, pile group can resist negative reactions. In case of shallow foundation, it is expected to locate resultant of forces within kern of base area. Obviously, here we also will try to coincide resultant of forces with centroid of pile group as this is the most economical solution. When a high structure, like tall transmission towers, chimney and water towers, has to be supported by pile foundation, some or all piles of a group may be subjected to uplift forces. The wind is the main force in this case which results negative reactions, horizontal forces and induced moments in piles. Earthquake loading may also produce such type of forces, here other terms liquefaction, lateral spreading, stability of slopes etc. several factors may be included. At first consider vertical forces, when resultant force, R is coincide with centroid of group having N numbers of piles, following figure shows a group of 16 piles. Now consider a bending loading is added to axial load to be supported by this group. Let area of each pile is Ap and average stress on pile is qi, for any pile that is located from centroid of pile group by a distance di. Now forces on piles located at a distance di on either sides of principal axis are not same. Positive sign of above equation defines load on pile which is located on that side of axis subjected to rotation downward due to applied bending loading toward that piles. The principal axes, x and y must be assumed passing through centroid of pile group. Let’s consider about horizontal forces on pile group. When spread footing is subjected to horizontal loading, the forces are transferred to soil underneath by friction between concrete and soil or through passive earth pressure of side of footing against soil. A key may be provided where horizontal forces are large which is very common in retaining wall. In case of piles in foundation system horizontal forces are resisted by shear stress developed in piles and by passive earth pressure. Batter piles are also a good option to resist horizontal forces. Battered piles do not perform as good as vertical piles to resist vertical loading. If the piles makes an angle θ with the line normal to base of pile cap, also known as batter angle, the efficiency of these piles is reduced by factor cosθ with an adjustment of pile number, N and moment of inertia of pile and pile group, I are required due to reduction on efficiency. 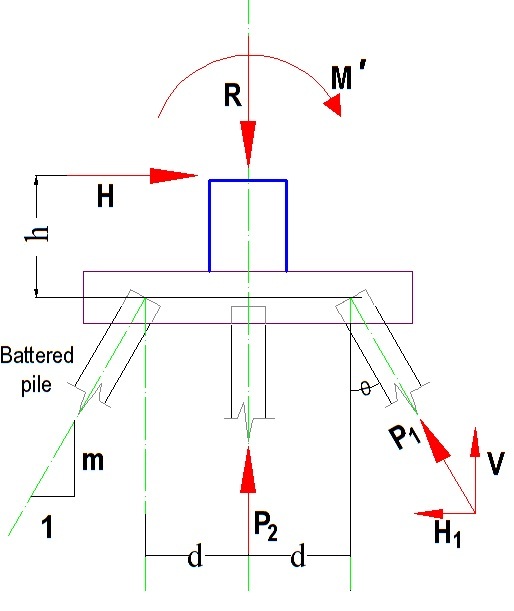 Above figure describes the components of allowable pile load P1. The vertical component (V1) is P1 cosθ and horizontal component (H1) is P1sinθ. 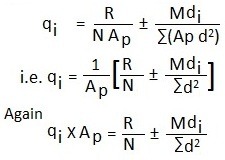 Now sum of total horizontal components of pile group must be enough to resist applied horizontal loading (H). Same is true for vertical components i.e. sum of total vertical components of pile group must be adequate to resist applied vertical loading (W).